So far as I know, this is the fifth album for unaccompanied trumpet which Wadada Leo Smith has recorded – the first of which – Creative music-1 – was recorded as long ago as 1971. Over the years he has also played quite a few solo concerts. He has, thus, probably more experience of this particular ‘form’ than any other jazz trumpeter. Add to that Smith’s lifelong fascination with the music (and personality) of Thelonious Monk and it is probably true to say that no other trumpeter could have tackled this project – on the face of it a highly improbable undertaking. What is certain is that no other trumpeter could have done so with anything like the same degree of success. The album is, in very large part, impressive and enjoyably rewarding. Smith’s respect for Monk is clear from the kinds of things he says about the pianist/composer in his booklet notes, where he calls Monk “A pure creative visionary/composer performer” and tells us “About 25 years ago, I received a compilation of 81 transcriptions by Bill Dobbins of Monk’s solo performances. I’ve been playing music out of that book for my own satisfaction ever since … I played it as a way of connecting with Monk’s ideas, knowing that if I spent 45 minutes or an hour playing over Monk’s compositions, then that would start to give me a very fluent idea about my own notes, about rhythm and melody”. 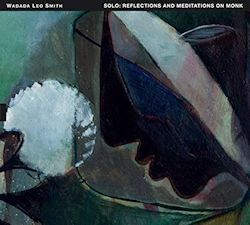 Just occasionally on this recording (as for example in ‘Reflections’) the intensity of Smith’s respect for Monk actually seems to inhibit him to some degree and the result is a performance which feels excessively careful, and less imbued than usual by fluidity, by intuitive risk and surprise.. There is, by way of compensation for such (relative) ‘flatness’, some wonderful music-making, not least in an exceptional reading of ‘’Round Midnight’. If it is true that there have been some 2,000 recordings of this piece, then (although I haven’t heard all 2,000!) I feel sure that the tonal beauty and formal subtlety of Smith’s interpretation must make this one of the very best of all of those recordings. Of the other three Monk compositions on the disc, ‘Crespucule with Nellie’ is, for me, the most satisfying, varied in tone and texture, witty in its treatment of Monk’s witty tune (my use of the word ‘wit’ here is not intended to refer to cleverness designed to provoke laughter, but rather to a quickness of intelligence, of musical lateral thinking, which exploits the unexpected and provokes thought, and perhaps a smile!). The tracks not based on compositions by Monk are compositions (or are they perhaps unscripted improvisations?) by Smith. Each is a musical response to a ‘sighting’ of Monk by Smith. Three (‘Monk and His Five Point Ring …’ and the two versions of ‘Adagio’) start from ‘sightings’ of Monk on video recordings. ‘Monk and Bud Powell’ originated, we are told, in a dream. These tracks, though they don’t directly imitate Monk, are, as it were, organic growths from Smith’s fascination with Monk as composer and performer, provider of “an inspiration that arcs straight across the structures invisible world” (to use Smith’s own words once more). Since the concern in these original pieces is not to imitate the surface characteristics of Monk’s musical language (which, in any case, could only be done very obliquely on the trumpet), Smith seeks, rather, to show us some of the ‘deeper’ things he has learned from Monk – one of which is the creative use of silence, “not as a moment of absence, or a space for resting, but as a vital field where musical ideas exist as a result of what was played before and afterward” (to quote Smith for a last time). The whole album demonstrates (as if fresh demonstration were really needed) what a remarkable instrumentalist Smith is, whether playing muted (as in ‘Reflections’ or ‘Adagio: Monkishness’) or with open horn (as in ‘Round Midnight’ and ‘Adagio: Monk, the Composer’). Almost an hour of unaccompanied trumpet may sound like a daunting listening experience; it is true that the music demands (and rewards) concentration – this is no ‘background’ music! But it isn’t discordant or simply ‘noisy’, being thoughtful and, as the album’s full-title suggests, ‘meditative’. The whole thing is profoundly musical and is warmly recommended, though I suspect that those who have followed Smith’s work will need no further recommendation.